new growth, originally uploaded by ordinarymoment. Our garden is simple yet teaches so much by just being, growing. 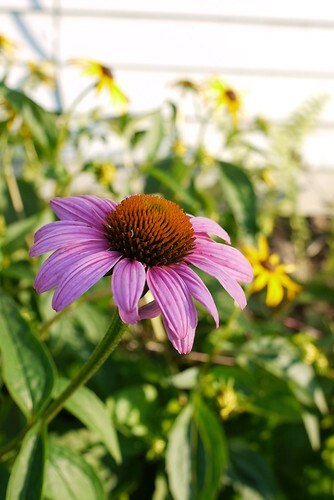 Purple + yellow coneflowers, black eyed susans, and hostas in abundance. There is always unexpected joy from perennials, how they change through the years + seasons. Last summer I carefully divided + transplanted these flowers + greenery from my parents’ garden, which came from my mom in-law’s garden before. Knowing that this sharing of beauty would take time to root itself into the earth before blooming again. How easy it is to have patience + faith your garden will grow each year, welcoming those first green shoots in spring, waiting to see the change a new summer brings. And oh, how it’s grown, my poor little withered plants of last summer now thriving + blooming everywhere. You place a bit of yourself into every plant you pat down into the earth, never really knowing what will come of it until it’s gone through the heat of a summer, into the often cold + harsh winter. You have faith that what you’ve done, the messy work of planting, the care + tending, is enough to bring new life + joy in all the years that follow. Accepting that things may not turn out as you expected, trying to understand that change + loss are unavoidable in life. So I carry this hope with me in all things. I have to find the good in everything, otherwise I don’t know how to fully live. As someone who is prone to worry, to think the worst, to let fear of so many things get the best of me, I just have to have faith that even in the most trying of circumstances, something of value will come out of it. This past school year I faced challenges + disappointments I never could have imagined. I had a hard time writing, weary from just making it through the day. I did my best each day with what I had, even though many days it didn’t seem like enough. So, I said a prayer (and another, and another…), took a breath, and got up and tried another day. I survived, and have been loving these quieter, relaxing days of summer to refresh. I will savor these last few weeks of summer, knowing another likely difficult season is beginning. But I will go forth certain that all the challenges that are ahead will serve a purpose in my life, helping me grow into a stronger person, teaching me lessons I couldn’t learn any other way. And I will keep dreaming, keep hoping for our journey to take a new turn, trying my very best to do all that I can to make that happen. In the meantime, I have an amazing husband, adorable puppy, cozy house, and bountiful garden to come home to at the end of each day.